This article is about a laboratory equipment. For other uses, see Water bath. 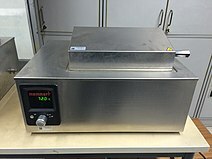 A water bath is laboratory equipment made from a container filled with heated water. It is used to incubate samples in water at a constant temperature over a long period of time. All water baths have a digital or an analogue interface to allow users to set a desired temperature. Utilisations include warming of reagents, melting of substrates or incubation of cell cultures. It is also used to enable certain chemical reactions to occur at high temperature. Water bath is a preferred heat source for heating flammable chemicals instead of an open flame to prevent ignition. Different types of water baths are used depending on application. For all water baths, it can be used up to 99.9 °C. When temperature is above 100 °C, alternative methods such as oil bath, silicone bath or sand bath may be used. It is not recommended to use water bath with moisture sensitive or pyrophoric reactions. Do not heat a bath fluid above its flash point. Water level should be regularly monitored, and filled with distilled water only. This is required to prevent salts from depositing on the heater. Disinfectants can be added to prevent growth of organisms. Raise the temperature to 90 °C or higher to once a week for half an hour for the purpose of decontamination. Markers tend to come off easily in water baths. Use water resistant ones. If application involves liquids that give off fumes, it is recommended to operate water bath in fume hood or in a well ventilated area. The cover is closed to prevent evaporation and to help reaching high temperatures. Set up on a steady surface away from flammable materials. 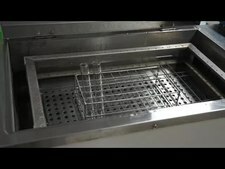 Circulating the water baths (also called stirrers ) are ideal for applications when temperature uniformity and consistency are critical, such as enzymatic and serologic experiments. Water is thoroughly circulated throughout the bath resulting in a more uniform temperature. This type of water bath relies primarily on convection instead of water being uniformly heated. Therefore, it is less accurate in terms of temperature control. In addition, there are add-ons that provide stirring to non-circulating water baths to create more uniform heat transfer. This type of water bath has extra control for shaking, which moves liquids around. This shaking feature can be turned on or off. In microbiological practices, constant shaking allows liquid-grown cell cultures grown to constantly mix with the air. Some key benefits of shaking water bath are user-friendly operation via keypad , convenient bath drains, adjustable shaking frequencies, bright LED-display, optional lift-up bath cover, power switch integrated in keypad and warning and cut-off protection for low/high temperature. LWIA seawater cleaning methods; water bath with injector block, septum support and insert. A water bath float rack. ^ Prudent Practices in the Laboratory: Handling and Disposal of Chemicals. National Academy Press, Washington, D.C. 1995. p. 95. doi:10.17226/4911. ISBN 978-0-309-05229-0. ^ "Thermo Scientific Precision and Lab-Line Water Baths" (PDF). thermoscientific.com. ^ "General Water Baths" (PDF). labwit.com. ^ a b "Baths and Circulators" (PDF). pubs.acs.org. October 2004. ^ a b "Standard Operating Procedure: Heat Sources and Heating Baths" (PDF). naples.cc.sunysb.edu. February 2013. ^ a b c d T.Mahajan, Devidas; Mohammad, Indira G. Shibi,Noor; Azharuddin, Quazi Syed; Masand, Vijay H. (2015-04-16). Chemistry Laboratory Safety Manual. BookRix. ISBN 9783736887664. ^ a b "Standard Operating Procedures Manual: Biosafety Level 2 Laboratory, Arizona State University". ^ a b Cheesbrough, Monica (2005-09-08). District Laboratory Practice in Tropical Countries. Cambridge University Press. ISBN 9780521676304. ^ a b "Fisher Isotemp Water Baths" (PDF). www.seas.upenn.edu. Retrieved 2015-07-09. ^ "Water Baths, Stir and Hot Plates" (PDF). library.ewh.org. This page was last edited on 14 March 2019, at 10:26 (UTC).